Friends of the Rideau is pleased to announce that we have brought a significant book about the Rideau back into print. 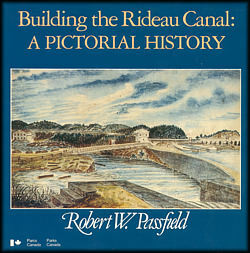 This book contains the best collection of beautiful colour and pencil sketches of the Rideau, done at the time of construction and in the early years of operation of the waterway. Noted Parks Canada historical researcher, Robert W. Passfield, provides expert interpretation of these images, in addition to engaging descriptions of the engineering of the works. A feature of the book are the period illustrations, done by Thomas Burrowes, John Burrows, J.P. Cockburn, Col. John By, R.E., Lt. Edward Frome, R.E. and others. The building of the Rideau Canal predated photography, so these beautiful illustrations are the only pictorial record of the construction and subsequent operation of the canal. Robert Passfield provides expert analysis of the features shown by each illustration. The book takes the reader lock by lock through the entire system, with discussions about how and why each lock was built. Passfield also discusses the background to the Rideau project, the events leading up to the building of the canal and the issues involved with the construction. The book also takes a detailed look at the engineering of the canal with a section devoted to the design and construction of the locks. Building the Rideau Canal: A Pictorial History, was originally published by Parks Canada in 1982 to help commemorate the 150th anniversary of the opening of the Rideau in May 1832. It is a significant book about the Rideau - anyone interested in the Rideau, or just to learn more about a fascinating bit of Canadian history should get a copy. This book is currently available for purchase through the Friends of the Rideau. All proceeds from sales of the book by Friends of the Rideau go to support our projects.